The H96 Max H2 Android box is without doubt one of the best value thin clients on the market. It combines a generous amount of system memory and storage capacity with competitive pricing and a recent Android build. Android will be celebrating its tenth birthday in September and the operating system has come a long way in terms of features and stability. Its versatility – and the fact that it is free – has made it possible for even the smallest vendors to come up with solid products at rock-bottom prices. And the H96 Max H2 is one of them. Online Chinese retailer, Gearbest, sent us the sample and sells the H96 Max H2 for just under $59.99 at the time of writing. Note that, while this price includes delivery, it is exclusive of any taxes that may be levied by HMRC or the courier companies on behalf of the vendor. Want to buy tech from online Chinese retailers? Read this first. This is an Android box – built by one factory and sporting various names – that can be used by businesses as a thin client to access cloud resources (and occasionally as a TV box thanks to a bundled remote control). Moreover, it manages to hit an incredible level of performance for not a lot of money. Before we proceed further, it’s worth noting that if you do decide to buy this product, make sure you opt for the right model. Gearbest also stocks a cheaper 32GB variant, but the saving you make isn’t worth it in our opinion. Get the 64GB model. 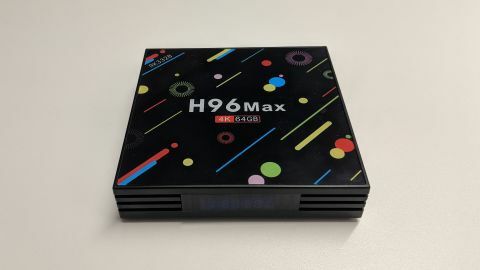 What makes the H96 Max special is the fact that it is the cheapest Android box sporting 4GB memory and 64GB of storage, offering enough capacity for those looking to install a decent quantity of apps locally. There’s nothing spectacular about the design of the H96 Max. It doesn’t have the cachet of the Voyo V3 Mini PC or the ambitious design of the Sunvell T95P PC-in-a-plug. Instead, it is a bog standard slab of plastic with sides that are 113mm long and 24mm high, sitting on four plastic feet. There’s an LCD display at the front which doubles as a status screen, and plenty of vents on five sides to allow the device to cool passively. The top is adorned by a funky lid made of plastic, and as for the ports, there are plenty with three USB 2.0 connectors, one USB 3.0, SPDIF and audio out, an RJ45 Ethernet port (100Mbps), HDMI 2.0 and an SD card slot. Another version of the box comes with a Type-C connector and a microSD slot, both of which are preferable in everyday life. The enclosure feels reasonably solid which means that you can easily carry it around in a bag, and that’s certainly a boon for those inclined to work remotely. The box is powered by a 5V/2A power supply unit that connects via a proprietary DC-in port. This is a missed opportunity as the manufacturer could have implemented a universal microUSB port, which would have made it possible to charge via a portable battery charger. The device uses an ARM Cortex-A53-based quad-core processor, clocked at up to 1.5GHz, with an ARM Mali-450MP2 GPU and support for HDMI 2.0 (delivering proper 4K@60Hz output). As expected you get 802.11n Wi-Fi and Bluetooth 4.0 but no Gigabit Ethernet, which is a shame. This is doubtless part of the cost-cutting to reach a low price point, and the same could be said for the use of USB 2.0 ports (in the majority). That said, the 4GB of DDR3 memory and the 64GB eMMC on-board storage more than make up for these cut corners, especially at this price. This Android box proved to be fast enough for most of the tasks we threw at it. The fact that it uses a quad-core processor with old GPU technology means that this box isn’t suited for games, as evidenced by the benchmark results. The H96 Max sports the sort of full-size menu screen expected on similar TV boxes, and it’s one that can be customized. The bundled applications are also heavily focused on entertainment rather than work, but Google Play is only a few clicks away anyway. The Scishion V99 is the most potent alternative, swapping storage capacity (halved to 32GB) for a steep 27% price discount, and a doubling in the processor’s core count. The Android version (5.1.1) used is nearly two-years-old, though, and there are no USB 3.0 ports at all, so proceed with caution on the V99. If connectivity is critical, then the circular-shaped R-TV Box R10 is worth considering. It has half the on-board storage but is cheaper, has a more potent GPU subsystem, a Gigabit Ethernet port and 802.11ac Wi-Fi. The icing on the cake is the great looking design. Last but certainly not least is the Scishion AI One which is a tad more expensive than the H96, and has half the on-board storage, but shines thanks to its metal enclosure and the incorporation of the latest version of Android (8.1). This is, in fact, the only Android TV box we know that sports this build of Android, and the only non-branded one that supports voice control. The H96 Max H2 is eminently usable as a thin client regardless of whether you plan to deploy it in a business setup, or use the device at home for leisure. Its dimensions and price mean that the H96 will appeal to even the smallest micro-businesses out there. Just don’t expect anything fancy; the unique selling point here is value for money. 4GB of RAM and 64GB of on-board storage should keep you going for a while, but support is likely to be patchy (excuse the pun) and firmware updates non-existent. The fact that we couldn’t track the name of the manufacturer just shows that some Chinese vendors have a long way to go before they achieve the status of, say, Xiaomi (or even Chuwi). Overall, though, if you don’t mind the above caveats, you’ll be purchasing a great little computer that can punch well above its weight. Just don’t expect exceptional aftersales support with this device. Ideally, we’d like to have seen a microUSB power connector, USB 3.0 rather than USB 2.0 ports, and a Gigabit Ethernet connector, but none of these are deal-breakers for what is otherwise a great product.